British Modelling and Electrical Co. Or. British Engineering and Electrical Co. I recently decided to re, restore my little " Leek " number 3 gas engine. I dropped the term " Atmospheric " because they work more on the lines of heat expansion against the piston rather than atmospheric pressure against the back of the piston. These engines were made in three sizes, the bore diameter of mine being the largest at 1 1/4 inches. Designed specifically to run on " Town gas ". The working principle is very simple. Starting at TDC the piston travels back drawing air through the top atmospheric valve with a mechanically operated fuel valve also opening at the same time. At about half the back stroke the piston uncovers the ignition port where a small external flame burns continuously, this flame burns through the port ignighting the charge inside the cylinder. A rapid expansion of the burning gas and air forces the piston to BDC, the stored energy within the flywheels carries the piston through the entire exhaust stroke back to TDC, the next cycle begins again. Many attempts were made to run this engine on our modern gasses, even petroleum/air vapour to no avail. I ended up fitting a modified HT spark plug and a timed ignition system to run on Propane. Recent events have uncovered an old patent, a method of producing a similar gas from the interaction of a Carbon arc under water. This gas is amazing, it burns very rapidly and is a " searching " gas, it finds its way through the narrowest of gaps! Does anyone, anywhere have any original plans/drawings for the Leek range of engines? They sold many kits. I need to know the correct hole diameter for the flame port. I'm currently running at 1/8" dia but there's insufficient pressure being generated to carry a stroke. Oh and by the way, feel free to post pictures of any related principle engines, I know that there were a few different makers around the world. Re: British Modelling and Electrical Co. Or. British Engineering and Electrical Co. There is an old advert on Graces Guide. My engine is an original British Engineering and Electrical Co . So the ignition port is 40 thou, are there any kits running, to your knowledge? Yes. The easiest way to set them up to get them running is to swop out the ignition port with a glow plug. Then once you know it is running you can start playing with the gas type and size of the ignition flame etc. By all accounts you need acetylene to get it to run as it is the only real gas that has a wide enough ignition range. That advertisement brought back some memories! I have restored several of their 1/4 and 1/2 HP " Otto " cycle engines over the years and my Brotherinlaw still owns one of the horizontal steam engines pictured to the left.
" 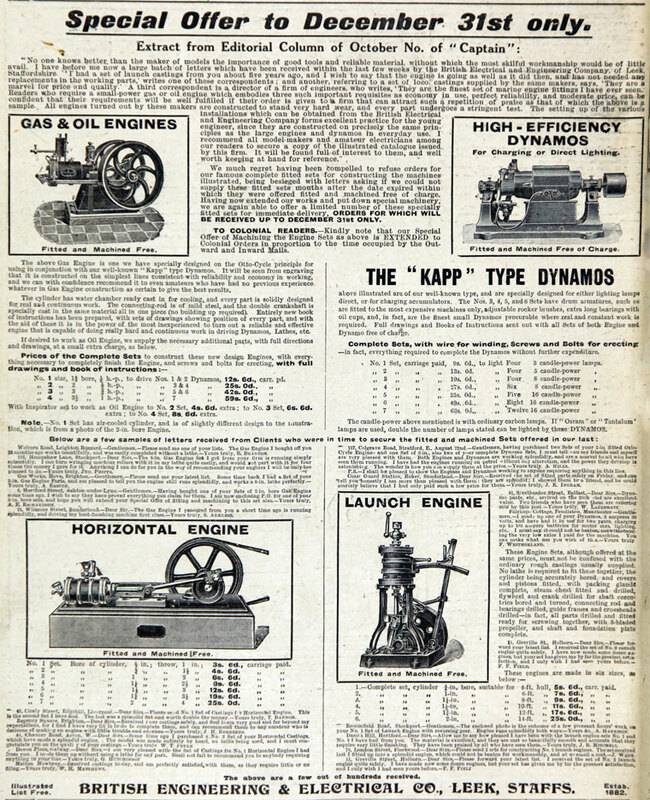 Dowson's gas " but seems to work very well on some of my early small power gas engines in my collection. My gas generator is currently in prototype form, the gas showed me that the fuel valve I had made thirty or so years ago leaked at every point! In fact the engine had been converted into an air pressure operated device when I bought it. Graham, have you tried acetylene gas? Small generators can be bought quite cheaply from some of teh specialist camping suppliers and even the odd model engineering supplier. This is the gas that Bruce Eng suggest for their version of the Schoenner engine. these engines run on coal gas, the only gas currently avaiable in those days, a mix of mainly methane with some hydrogen. Many thanks for the links you posted. I can understand why these little gas engines were collectively known as "Nurnberg's " on the Stationary engine rally scene ! I can't believe that I'm the only forum member who owns one of the " Leek " ones, surely there must be others about? No original plans hiding anywhere? I'm on the last leg of my refurbishment, a batch of 1mm dia drill bits arrived today to complete the new ignition port. 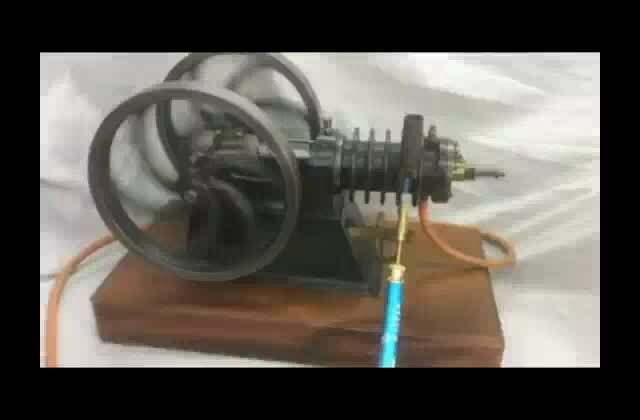 Hi Graham, I think I might have some videos of engines that operate on a similar principle to your Leek engine. I'll start looking through my collection of videos and add them as I find them. The engines all belong to Mike C.
This one is a Hoskins running on propane. This is a video in my Flickr album, click on the picture then on the play button in the middle of the picture on Flickr. Here's a Schoenner and a Leek also running on synthestised coal gas. This video is in my Flickr album click on the picture then on the play button in the miidle of the picture on Flickr. Here's a Schoenner running on propane until it blew a loose relief valve out of the top of the cylinder. These videos are in my Flickr albums click on the picture then on the play button in the miidle of the picture on Flickr. A Paradox which only runs on s synthetic coal gas mixed by Air Liquide. I thinks its mainly Hydrogen. Nice looking engines! Ah coal gas...just old enuff to remember the degassifier in town, had a quick google, methane hydrogen & carbon monoxide ( no wonder the stuff killed you with out knowing it), then they found natural gas here. Get excited and make something! Mike C certainly has a nice collection of engines. I was quite surprised to see the larger ones running on Propane only, I spent many hours fiddling around and gave up with the open flame. I re threaded a 10mm spark plug to 1/8" BSP and ran with HT ignition instead! In a plain burner, only the ethylene produced a luminous flame but the light output could be greatly increased by using a gas mantle. It's a very light gas by comparison to Propane/Butane and burns very rapidly. As a footnote I noticed one of Mikes engines had two snifters, might explain why my engine has a bung in the cylinder head? There was obviously some chatter going on at the time regarding running improvements? Bad Behavior has blocked 13746 access attempts in the last 7 days. Page created in 0.114 seconds with 19 queries.